Carve out the middle of the marshmallow. You can eat the center or discard it. Make the gelatin using one box of jello, six ounces water and six ounces vodka. Photo shows blue and red gelatin. Let the gelatin cool completely before pouring it into the hollowed-out marshmallow. It should still be liquid, just cooled. Use a dropper to add the gelatin to the marshmallow, it will help to keep the marshmallows clean. Refrigerate marshmallows until the gelatin has set. Eat them this way, or you can toast them first. To toast them, put them on a stick and roast over a campfire. Or for a quick effect (if you don't have a campfire), dip them in Bacardi 151 and light them on fire. But, just like roasting a marshmallow, make sure you blow out the flame out before eating! It seems like a totally wacky idea, but if you're looking for something that's just plain silly and fun, these are great! We saw these fun marshmallows jelly shots from That's So Michelle and we just had to give them a try and then take it a step further - BY LIGHTING THEM ON FIRE! Check out these Flaming Marshmallow Jelly Shots. These are definitely unique and you can be sure your guests have never seen or tasted one before, haha! If you're planning a Memorial Day camping trip, make these ahead of time and pack them in your icy cooler until it's time to break out the fun! You can use any color of Jello to customize them to your theme or holiday. Let the Jello cool completely before pouring it into the marshmallow. It should still be liquid, just cooled. I actually used a dropper to put the Jello inside and it worked well to keep the marshmallows clean. Refrigerate until the Jello has set inside the marshmallow. Then pack 'em up to then eat plain or you can toast them! Put them on a stick and give a quick toast over your campfire. 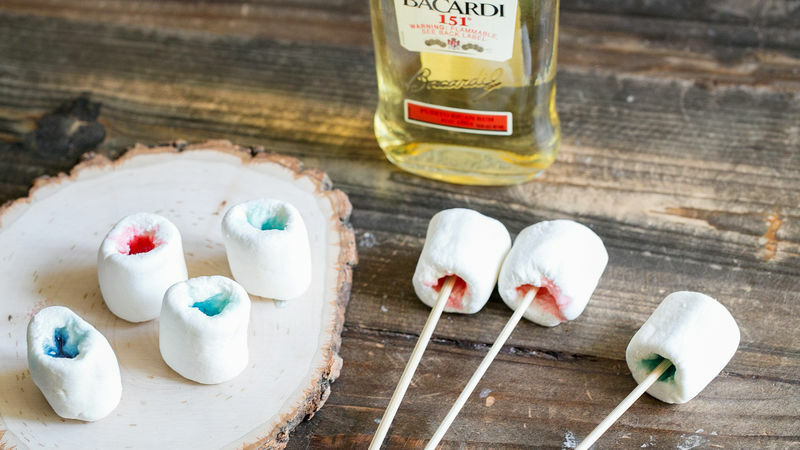 For a quick effect (or if you don't have a campfire), dip them in Bacardi 151 and light it on fire. Just like roasting a marshmallow, make sure you blow out the flame out before you eat it! Don't stop the party! Here are more shot recipesfor your next get-together!